Brennan Gleason, a graphic designer from Fraser Valley, British Columbia who enjoys making home brewed beer in his spare time, decided to marry the two skills together in his search for a job and created “Resum-Ale“, a 4-pack of blonde ale to send to potential employers. The original packaging includes Brennan’s résumé along with his “portfolio” on each of the four bottles and a bespectacled logo on the caps. One of my self promotion pieces. 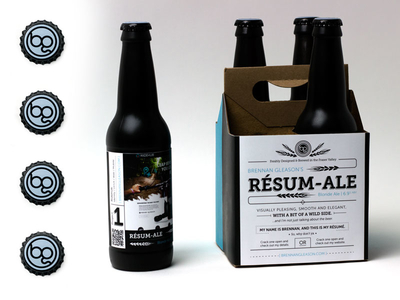 Resume + Beer = Gleason’s Resum-Ale. I brewed up a nice blonde ale, so I figured it would awesome to use it to promote myself and my work. Box contains the resume and the bottles each contain a piece of my work.